Pulsus alternans is a phenomenon regarding cardiovascular system. In this phenomenon, the pulse pressure changes every second that one pulse pressure is different from the next pulse. The pulse pressure may be strong or weak and normally occurs during a sinus rhythm. The phenomenon of change in pulse pressure cannot be indicated in electrocardiogram and via diastolic filling time, as it do not show any effect on them. 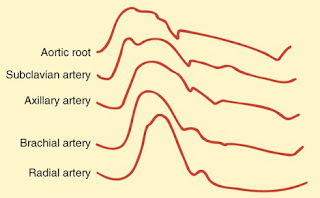 The amplitude of every pulse in arteries is differ from the other one. These changes in pulse amplitude or pulse pressure indicate the condition of severe ventricular failure. Usually pulsus alternans is seen in aortic and mitral valve stenosis, hypertrophic cardiomyopathy and congestive cardiomyopathy. It is also seen in patients with effusive pericarditis and conditions in which general anesthesia is used. The presence of pulsus alternans shows that either the condition of patient is critical or not with the underlying disease. There are many methods of diagnosing pulsus alternans and detection of palpation is one of them which can be checked via use of sphygmomanometer. If the difference between two pulses per beat is less than 20mmHg then it would be difficult to diagnose it through palpation. There are many causes reported behind pulsus alter nans and scientists combine them to two main basic causes which are physiological actions. The 1st main cause is frank-starling mechanism. In this mechanism, the alternations in venous return causes the blood to enter in heart in greater amount. When this increased amount enters ventricle, it stretches like a rubber band and after maximum stretching the blood ejected in greater volume which increases pressure in veins known as pulse pressure. The 2nd cause reported is handling of calcium by the cells. As calcium acting directly on cells causes contraction of muscles leading to change in pulse pressure. Pulsus alter nans is a symptom or sign of severe cardiac failure. As failed heart is not able to eject blood volume up to the level it needed and sometimes ejects greater blood volume this alternation in pulse pressure is the pulsus alter nans. Sometimes the functioning of liver is effected due to alteration of pulse pressure. The increase in systemic venous pressure, causes the extracellular fluid to enter in surrounding tissues which also involves alveoli and it ultimately lead to edema formation and crackles. Patient may also suffer from fever. Pulsus alter nans is itself a symptom regarding severe cardiac failure. Nurses who are appointed in I.C.U unit should be aware of this condition. The medications used to treat high blood pressure can also treat alterations in pulse pressure. Angiotensin converter enzyme inhibitor (ACE inhibitor) and anti-coagulants are prescribed for the treatment of pulsus alter nans. Anti-coagulants are used to reduce the chances of cardiac stroke. If changes in pulse pressure occur due to long QT syndrome, then it can be treated with the correction of metabolic abnormalities and sometimes with left sided cervicothoracic sympathetic ganglionectomy.